I was going to the fleadh in Derry at the weekend, and of course, snacks are an essential part of festival gear for me. I tend to require a snack in the wee hours, and I rarely make it to breakfast, so it’s important that my snacks be a balanced meal. Like peanut butter cookies. Because peanut butter contains protein, and then there’s the cookie bit for carbs, so they give you enough energy to make it until lunch. 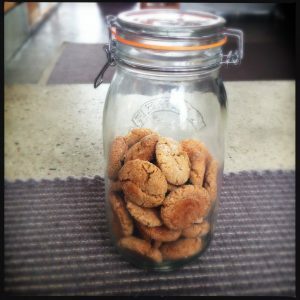 Yes, this is how I rationalise eating large amounts of peanut butter cookies. 1. Preheat the oven to 350 degrees F/175 degrees C and line two cookie sheets with parchment paper. 2. In a small bowl, sift together to flour, baking soda, baking powder, and salt. 3. In a large bowl, beat the butter and peanut butter together on medium-high until light and fluffy. Beat in both of the sugars until fluffy and blended, followed by the egg, vanilla extract, and milk. Finally, beat in the flour mixture until incorporated. 4. Roll a bit of the mixture into a 2cm ball, and then roll the ball in some caster sugar to coat it. Place the ball onto the cookie sheet, and repeat, spacing the balls about 2cm apart (they will spread in the oven). 5. Bake 10-12 minutes (they will not look quite done, but this is what you want) and let cool on wire racks.